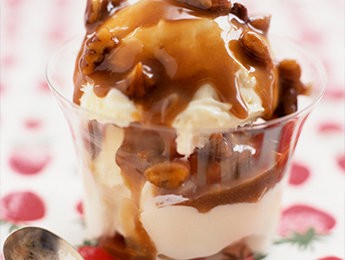 Check Out These Ice Cream Topping Recipes! In a medium saucepan over medium-low heat, whisk together brown sugar, evaporated milk and butter. Cook, whisking often, for 7 minutes or until sugar is dissolved and mixture is smooth. Whisk in vanilla and pecans and cook for 3 minutes. Remove pan from heat and let cool to the touch; sauce will thicken as it cools. Serve over your favorite ice cream.